Here is Some information about Girijatmata Vinayak(Ganesh temple) Temple in Lekhan hills Maharashtra India. 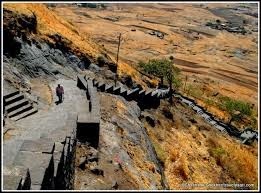 Location: Lekhan hills, at a distance of about 160 km from Pune enroute to Nasik. 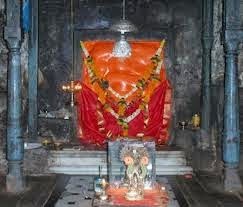 The Girijatmaj Vinayak Temple is located at Lekhan hills from 160 km from Pune enroute to Nasik.This temple is dedicated to lord Ganesha.Girijatmaj Vinayak's Temple is in the 8th cave. 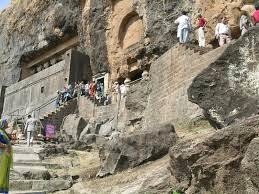 These caves are also known as Ganesh Gufa. The temple is built out of a single rock and is Dakshinabhimukh- facing south. 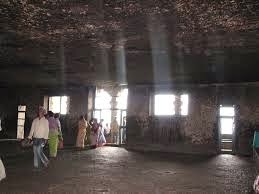 The Sabhamandap (temple hall) has 18 Overees (small rooms for meditation) within it. The idol of Girijatmaj Ganesh is in one of the rooms.Girijatmaj literally means Ganesha the son of Girija (Goddess Parvati). According to the Legend Goddess Parvati who had a strong desire to have Vinayaka as her son performed penance for 12 years in the caves of Lenyadri to fulfil her wish. Pleased by her dedication Lord Ganesha blessed her and on the day of Bhadrapada Shudh Chaturthi when Parvati was worshipping an idol of Lord Ganesha it came alive and told her that her wish has been granted. By Bus: Girijatmaj Ashta Vinayaka Temple of Lenyadri is easily accessed by road. State Transport buses are available from Pune Shivaji Nagar Bus Stand and Mumbai Central Bus Stand to reach Junna. By Rail: The Nearest Railway station is Talegaon.Station. By Air: The Nearest Airport is Pune Airport.